If you are looking for information on the Dunn Bros Coffee franchise business opportunity, Dunn Bros franchises or Dunn Brothers Coffee franchising, then you have come to the right place. 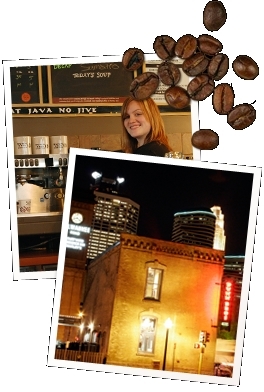 Since 1987, Dunn Bros Coffee™ has been a stand-out in the coffee house market. There is a tremendous amount of market potential yet to be tapped in coffee, and many people are looking for a very high quality alternative. Success can be achieved in today's competitive world by having a distinctive point of difference. Dunn Bros Coffee™ shops exhibit this difference by utilizing state of the art, on-site micro-roasting techniques. So on a daily basis, our locations are roasting very select, high quality coffee beans ... right in front of our customers. Coffee Beans have the greatest aroma and flavor within 3 to 5 days of roasting. We take the beans right from the cooling tray and immediately put them up for sale at the whole bean bar or grind them as needed for immediate use in our wide variety of coffee and espresso drinks. Any competitor using a central roasting facility (with its' packaging, shipping, warehousing, and transit) does NOT truly offer "fresh roasted" coffee. FRESH IS BETTER. Do you like your bread in a plastic bag two weeks after baking? - Or - Do you prefer delicious bread fresh out of the oven? Freshly roasted coffee has this same impact, and it is part of the reason we continue to win First Place in the "Readers Poll Awards" over competitors with household name recognition. We can greatly reduce waste by only roasting as much coffee as our business demands. We place our roasters in high-visibility locations within the shop so patrons can easily view the roasting activity. This is both interesting and entertaining for our customers. They appreciate the opportunity to learn more about coffee ... which helps us to sell more high-margin whole bean coffee by the pound. The wonderful aromas of fresh roasted coffee fill the air and keep our customers coming back for more! You can realize a considerable gross-profit margin advantage (over buying pre-roasted coffee beans) because of our purchasing power on green (un-roasted) beans.